Motorola has launched its new Moto E (2nd Gen) smartphone in the Indian market. This new Moto E is now available exclusively on Flipkart for Rs. 6,999/- only. 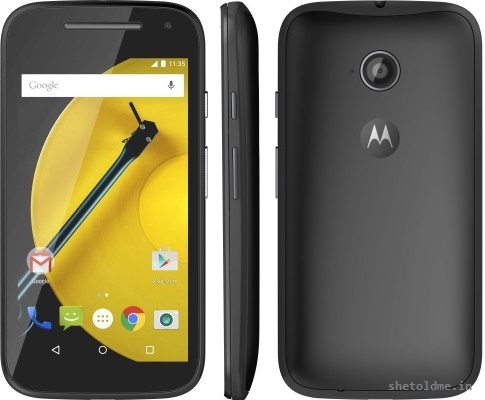 The Moto E 1st Gen will continue selling for Rs.5,999/-. This 2015 Moto E runs on Android 5.0 Lollipop Operating System and also includes some software enhancements like Quick Flick, Moto Assist and more.It also got dual-SIM with 3G and is available in Black and White colors. Motorola also providing removable bands for this new generation of Moto E. So, users can easily customize the new Moto E design by swapping the six additional colorful bands. Introductory Offer Price of Rs.6,999. Offer till stocks last. So, what your moto ? Are you buying this one?